Wild Grape Bistro just keeps getting better. When I last wrote about the Wild Grape New West Bistro—two years ago, a couple of months after it opened—I was being impressed by the upstart wine bar/restaurant that took over where the still-missed Avenues Bakery & Café used to be. I liked the food, service and the wines offered at Wild Grape a lot. So, why did it take me two years to return? Beats me. But recent visits to the Bistro were proof that not only is the crew there sustaining their early excellence, but they have actually improved. One meal—a Sunday-night stopover on the way back from Las Vegas—was as satisfying as any I’d enjoyed during my stay in Sin City, and I’d had quite a few great meals down there. The kitchen team has changed since the earliest incarnation of Wild Grape Bistro. For a while now, chefs Phelix Gardner and Pete Hines have been commandeering the stoves, with delicious results. The gaudy number of awards they’ve garnered—including some from City Weekly—is testament to their talents. But, awards don’t necessarily make a restaurant worth your time and money. Happily, from recent revisits, the Wild Grape bunch seems to be at the top of their game. 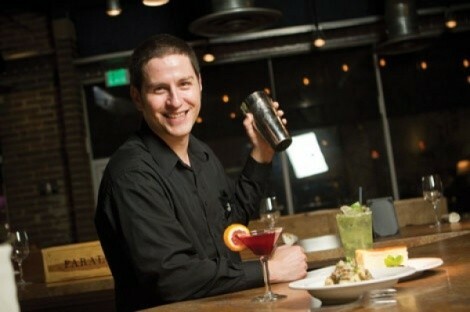 Head bartender Sean Neves will tickle your fancy with a pre-dinner cocktail. He’s one of the best mixologists in town—as well as a monster guitarist—and he’s always ready to whip up a creation like Hendricks Gin, cucumber, mint, celery and cilantro, all muddled together in a tall glass with a salted rim. And, since the Wild Grape is a wine bar, there’s a decent selection of wines by the glass, splash or bottle at the bar or table. Should you need proof that owner Troy Greenhawt and his crew are serious about wine, how about the fact that in December they hosted four wine dinners: Latour, Charles Krug, Selby and Donkey & Goat. You can look forward to more in 2011, as well as weekday breakfasts, which Greenhawt says will begin soon. They already do brunch on Saturday and Sunday. One of the better bargains around is the Wild Grape’s Sunday supper special, which is a three-course prime rib dinner for a mere $28. My Sunday meal consisted of a juicy, cooked-as-ordered, 10-ounce, medium-rare slab of in-house, apple-and-cherry wood-smoked prime rib with horseradish au jus. It was particularly smile-provoking paired with a glass ($6.50) of Australian Green Point Shiraz. With the Sunday special, there’s also a choice of soup or petite salad and dessert. Wholesome, barley-chicken-kale soup had a nice black pepper kick. Accompanying the Prime rib were luscious, creamy whipped potatoes and sautéed zucchini and mushrooms. At dessert, I balked at the idea of blue-cheese cheesecake, but there was enough sweetness to make this my favorite cheesecake ever! To my surprise, the Wild Grape was bustling on a Sunday evening, while most of downtown was dead. And our server, Kelly, couldn’t have been better or friendlier, hitting all the right service notes. So, if you’re looking for a place to eat out on Sunday—either for brunch or dinner—keep this place in mind. At lunchtime, how can you resist a classic Croque Madame ($10.50)? It’s a heart-stopping sandwich with ham, Emmentaler cheese, fried egg and Mornay sauce. Well, there goes that New Year’s diet resolution! On the lighter side, the saffron-infused acorn stew with veggies, chickpeas, apricot and fried fennel ($13.75) is even vegan-friendly. An aspect of the Wild Grape that appeals to me is that you can simply graze or go whole hog. At one dinner, my wife was happy with nothing more than one of the small plates on the menu—although, in this case, “small” isn’t really very accurate. In most restaurants, the plentiful serving size of the “small plate” potato gnocchi with tender shreds of braised beef short rib, mushrooms, spinach and a light spritzing of truffle oil ($11.50) would have sufficed as an entree. It was absolutely wonderful. And, this dish is about to get even more wonderful: Greenhawt told me that lobster gnocchi is about to make an entrance on the menu. Count. Me. In. The causal, welcoming vibe at Wild Grape Bistro encourages family-style dining, with lots of sharing of food and wine. I’ve been gladdened to see, during recent visits, wine bottles on nearly every table in the restaurant, and happy people enjoying the company of friends and family. The moderate wine prices make it an easy place to celebrate. Sure, you could spend $82 on a bottle of Archery Summit Premier Cuvee Pinot Noir, but you don’t have to. There are plenty of bottles of very good wine in the $25-$40 range, and 2-ounce splashes of wine for as little as two bucks or even less: $1.75 for 4 Bears Napa Cabernet, which happens to be one of my favorites. A can’t-miss dish from the current menu is pan-seared striped bass ($23), which is a generous bass filet accompanied by a crisp risotto cake, mussels in-the-shell and bouillabaisse broth with fennel. Also for seafood lovers, there’s an 8-ounce lobster tail from the wood-burning grill, with smoked paprika, saffron risotto, braised fennel and Meyer lemon butter sauce ($33.50). Or, if duck is your thing, duck confit on whole-wheat flatbread with Brie, arugula and caramelized figs and onions ($11.75) is duck-licious, as is the pan-seared duck breast with butternut squash ravioli, baby carrots and a sweet-tart huckleberry gastrique ($21.50). It’s a bit early in the New Year to begin making predictions, but here’s one I’ll bank on: It won’t be another two years before I return to Wild Grape New West Bistro to enjoy the terrific food, wine and service there.